The Futura’s distinctive mirror/indicator housing can get damaged in a crash or a tip over and is expensive to replace. Though the indicator lenses can be cheap to get hold of, the mirror glass isn’t – and standard mirror glass doesn’t give as wide a view. Aprilia lists the whole unit – stalk, indicator and lens – as a single part and you can wait a long time for one. The right mirror lens often fell out on new bikes and continues to do so on new replacements – so if you buy a new one, make sure it’s well stuck in! 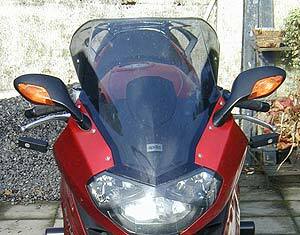 However, you can replace stock mirrors with mirror/indicator units from other bikes without too much difficulty. The 04-08 Aprilia RSVR is a prime candidate, while recent Suzuki GSXR1000 mirrors will also go on. 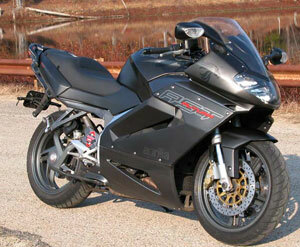 I’ve even heard of Kawasai ZX10 mirrors being used. The only criteria seem to be integral mirror/indicators and matching spacing between the mounting bolts. If you fit RSVR mirrors, you’ll need extenders and even then they tend to give a view of not much more than their elbows. Befbever has produced an excellent guide to fitting the RSVR mirrors. Here it is: Apriliaforum.com: Mirror, mirror on the wall…. Here’s BHW’s thread on GSXR mirrors: Apriliaforum.com: Will GSXR mirrors fit? Remember the air temperature sensor is located in the left mirror and will need relocating.